Until not long ago deformities caused by localized fat deposits did not have an acceptable surgical solution. Liposuction is a technique that has revolutionized the corrections of those problems. Liposuction is not a treatment for obesity; it corrects those body areas in which we persistently find fat deposits that cannot be corrected just by dieting. With this technique fat can be removed from different parts of the body: hips, thighs, knees, ankles, arms, abdomen, face, etc. It some cases it is performed along with other procedures (face lift, abdominoplasty, etc). Liposuction is normally performed under local anaesthetics and sedation, although in some extent cases it can be performed under general anaesthetics. The procedure, always carried out in an operating room, mainly involves the suction of the fat using a surgical vacuum or syringe attached to a cannula and making several tunnels previously marked in the area being treated. After the procedure, you will have to wear an elastic corset or bandages wrapping the treated area. It is quite common for the tissues of the treated area to present bruising or swelling. You should not assess the results of the liposuction until at least three months after the surgery. If skin elasticity was altered, there might be some irregularities or small depressions, which might require additional corrections through selective liposuctions and/or fat injections. Women can undergo liposuction in the jowls, hips, thighs, and abdomen, under the arms or around the breasts. Liposuction, also known as liposculpture, removes fat deposits from some areas of the body, including cheeks and neck, arms and breasts, abdomen, buttocks, hips and thighs, knees and ankles. Liposuction is not a substitute for dieting, but a method to remove localized fat deposits that do not respond to diet or exercise. If you are thinking of undergoing a liposuction, you will get some basic information about the surgery, about when it is indicated, how it is performed and what results to expect. However, it is unlikely that you get answers to all your questions, as they mostly depend both on personal factors and the plastic surgeon’s preferences. Los candidatos ideales para someterse a una liposucción son aquellas personas que poseen un peso relativamente normal pero que tienen acúmulos de grasa en áreas localizadas. Si usted posee un estado general de salud bueno, tiene una estabilidad psicológica, y es realista en sus expectativas, será un buen candidato. Lo más importante para obtener un contorno final óptimo es poseer una piel firme y elástica (la piel que “cuelga” no se redistribuirá sobre el nuevo contorno corporal y podría requerir algún procedimiento quirúrgico adicional para eliminar el exceso de piel). La liposucción no está recomendada si se ha tenido una cirugía reciente en la zona a tratar, si se tiene mala circulación en esa zona o si se padecen problemas cardiacos o respiratorios. Es importante saber también que la liposucción no mejora la celulitis. La liposucción mejorará su apariencia y la confianza en uno mismo, pero no conseguirá que nos parezcamos a otra persona o que nos traten de manera diferente. Antes de decidir si se va a realizar una liposucción piense qué quiere conseguir y discútalo con su cirujano plástico. The least frequently treated areas in men include the jowls and the hips. It can also be used to reduce breast enlargement, also known as gynescomastia. 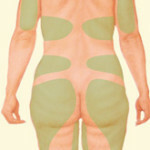 Result after liposuction in the marked areas. In the first visit, the plastic surgeon will assess your health, determine the extent of the fat deposits, and assess your skin tone and firmness. You will be informed about other procedures that are normally used to improve body contour, like abdominoplasty, and the plastic surgeon will discuss with you the different options or combinations of procedures that might be appropritate for your case. You must speak sincerely and frankly about your expectations, so that the surgeon can also be frank and discuss with you the available alternatives for your problem, informing you about the risks and limitations of each and every one of them. You will also be informed about the kind of anaesthetics that will be used, about the need of being admitted in the clinic where the surgery will be performed and about the cost of the procedure. Liposuction for aesthetic reasons is not included in the procedures covered by the National Health Service. You must inform your plastic surgeon about important weight fluctuations. You must let your surgeon know if you are a smoker or if you are currently taking any medication or vitamins. Do not hesitate to ask any doubt you may have, especially those related to your expectations. If you are going to have a large liposuction, discuss the possibility of autotransfusion; if your plastic surgeon finds it necessary, your own blood will be extracted beforehand and used to replace the blood and fluids that you might lose during surgery. You will be given directions about how to prepare for the surgery, including instructions about food and liquid intakes, smoking and the administtration of drugs or adjustment of current medication, including vitamins and iron supplements. If you have a cold or any kind of infection, especially cutaneous ones, the surgery might be postponed. Be sure to arrange for somebody to take you home once you are discharged and, if necessary, to help you out for a few days. Healthy patients, without overweight, with localised fat deposits and elastic skin, are the best candidates for liposuction. Patients with localised fat deposits (in hips, buttocks and/or thighs) are good candidates for liposuction. 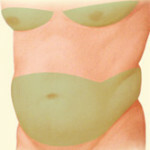 Liposuciton is performed in an operating room, in a clinic or hospital. It must not be performed in premises that do not fullfill the basic conditions of asepsis and equipment. Very often it is performed in an outpatient basis, and admission in hospital is not necessary. In large liposuctions the patient might have to stay in hospital for 2 or 3 days. If the procedure is not very extensive, that is, if the amount of fat to be removed does not exceed the amount estimated by the plastic surgeon according to your health, body build and surgery, it can be performed under local anaesthetics and sedation. In some cases, epidural anaesthesia, the same one used in childbirth, can be used. When a plastic surgeon is planning to perform a liposuction in large areas or in different areas at the same time, general anaesthesia is preferred. A liposuction may last between 1 and 2 hours, but the time can vary a lot (from 30 minutes to several hours) depending on the area and amount of fat. First, a small incision is made and through it a hollow tube called liposuction cannula is introduced. The cannula is attached to a surgical vacuum or syringe. Using a back and forth motion, the plastic surgeon moves the cannula inserted in the fat deposits under the skin to dilute the fat and then suctions it. Sometimes it is necessary to perform several incisions to remove all the fat deposits. When the procedure is performed under local anaesthetics, you might feel some vibration or friction. During liposuction, you will lose some fluids along with the fat, which must be replaced to avoid the occurrence of a shock. You will be administered some fluids intravenously and, if necessary, even a blood trasfusion (normally an autotransfusion). The surgeon introduces hollow cannulas through small incisions in the skin. Wearing a compression garment after the surgery helps control swelling. The results become apparent after 6 weeks. The compresion garment must be used 24 hours a day for 2 months. It will help minimize swelling and compress the skin to the body contour. Once the swelling is controlled, the garment must be adjusted to ensure it works properly. To do so, you will require the services of a dressmaker. The padding must be used day and night during the first month and only 12 hours a day during the second month. The padding will help compress and shape the skin, and protect it from the garment seams. The first 10 days after the surgery, the following foods must be avoided: meat, fish and raw seafood, milk, fried food and other foods that might be irritating. Avoiding the intake of these foods contibutes to a fast and better scarring. You must not sunbathe for the first 2 months after the surgery. Sun exposure can darken the skin of the scars and of the areas where there was bruising. Initial postoperative care might require additional therapies for lymphatic drainage or ultrasound to improve and speed up the scarring process. If you live outside Barcelona, you might want to locate beforehand a place that offers these services. Postoperative care is essential in order to obtain the best results. To do so, you will have to follow a proper diet and do exercise at least 3 times a week. Dr. Blanch and his team will schedule follow-up visits to monitor the recovery and assess the result. ARE THERE RISKS? ARE THERE GUARANTEES? Liposuction is a safe technique as long as the patient is a good candidate, the operating room is well equiped and it is performed by a qualified plastic surgeon. However, in some cases complications may arise, especially when big amounts of fat are being removed in the same procedure. Another rare but possible complication is fluid accumulation, which must be drained, and skin lesions. Although serious complications are very are, infections and excess fluid loss can result in a serious situation. The risks can be minimized by choosing a qualified surgeon, who will perform the surgery in an accredited surgical facility, and by following the instructions. Liposuction scars are minimal and are strategically located in areas where they can be easily concealed even when wearing a bikini. However, some aesthetic problems can arise regardless of the experience of the plastic surgeon, such as rippling skin on the treated area or irregular pigmentation, which can become permanent if exposed to the sun. In some cases, there might be some asymmetries that might require further surgery. Liposuction is an effective technique for improving your body contour with minimum scars. The results can be permanent as long as you follow an appropriate diet and practice regular exercise. If you gain weight, it will be more homogeneously distributed and not only localised in fat deposits. Most patients are very satisfied with the results of their liposuction; they can use a wider variety of clothes and are happier with their bodies. As long as you have a realistic outlook, you will be happy with your new body contour. – Information obtained from www.secpre.org.